Where do pants go? Do they go on your head? Do they go on your neck? No This humorous story shows kids how to put on their clothes--from the underwear on their bottoms to the hats on their heads and everything in between. 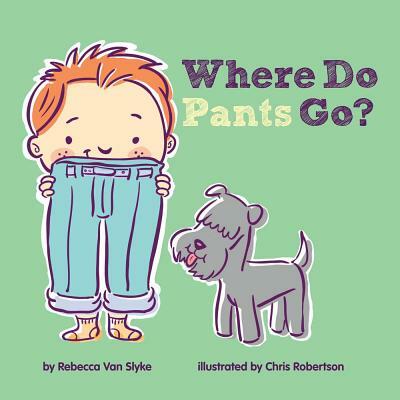 But sometimes getting dressed doesn't happen without a few fun missteps These adorable toddlers and their trusty dogs are sure to tickle every young reader . . . from their funny bones to the bottoms of their soles. Rebecca Van Slyke earned her MFA in Writing for Children and Young Adults from Vermont College of Fine Arts. She writes picture books, easy readers, nonfiction, middle grade fiction, and poetry. She has illustrated five of MaryAnn Kohl's art books for children--Discovering Great Artists (Bright Ring Publishing), Global Art and Primary Art (both Gryphon House), Great American Artists for Kids, and Storybook Art (both Bright Ring Publishing). She is the author of Mom School (Random House/Doubleday), and forthcoming picture books Dad School (Random House/Doubleday) and Lexie, The Word Wrangler (Penguin), due to be published in 2017. Rebecca is a second-grade teacher in Lynden, WA, where she lives with her husband, daughter, and a very spoiled dachshund. She is on the advisory committee for the Western Washington SCBWI and leads a writing group in Bellingham, WA. You can find her online on Facebook or at her website rebeccavanslyke.com. Chris Robertson is an author-illustrator from Pasadena, CA. He graduated from Cal State Northridge with a degree in illustration. He spent 10 years freelancing for magazines and newspapers before becoming a storyboard artist for Nickelodeon Animation Studios. His most recent books are Giraffes Ruin Everything, written by Heidi Schulz (Bloomsbury), Harry and the Hot Lava (Xist Publishing), My Yellow Umbrella (Xist Publishing), I'll Trade My Peanut-Butter Sandwich (Kite Readers), and Little Miss Liberty (Chronicle Books).